Over 4.5 million people from different pockets of the world call Berlin, the capital of Germany, their home. A city badly damaged during World War II and starkly divided during the Cold War, Berlin is known for its complicated past which has carved the city into very distinct neighborhoods. Each neighborhood has its own cultural makeup, history, nightlife, and food scene. 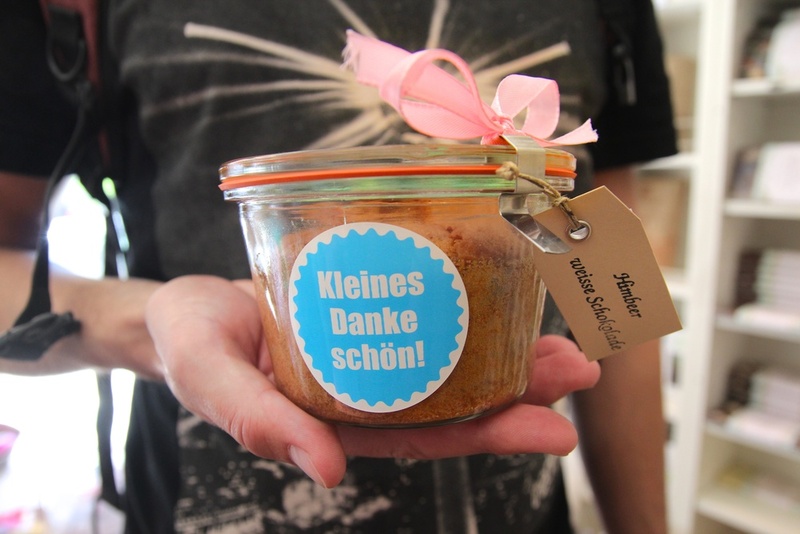 With so many different food options, Berlin hosts many different food tour companies. I ended up selecting a company called “eat-the-world”, which has food tours all over Germany. 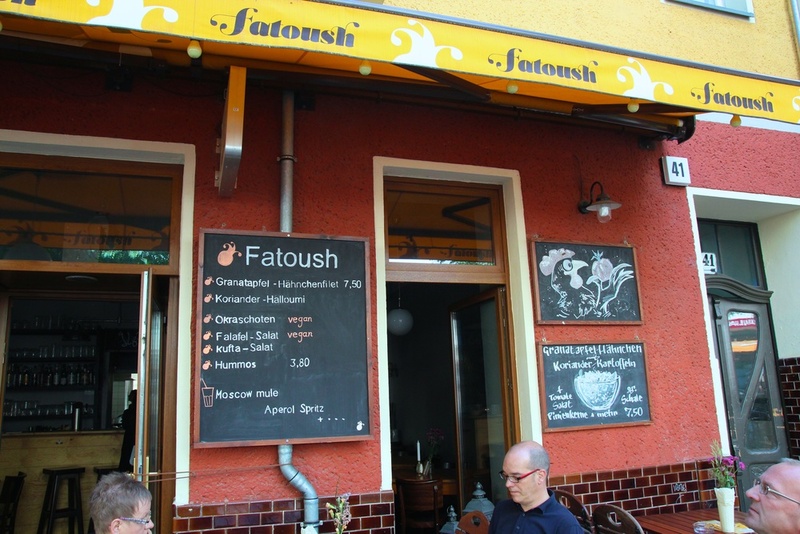 In the interest of timing and tour options, I opted for the Friedrichshain neighborhood tour. Patrick served as my translator and hand model for this German-spoken tour. 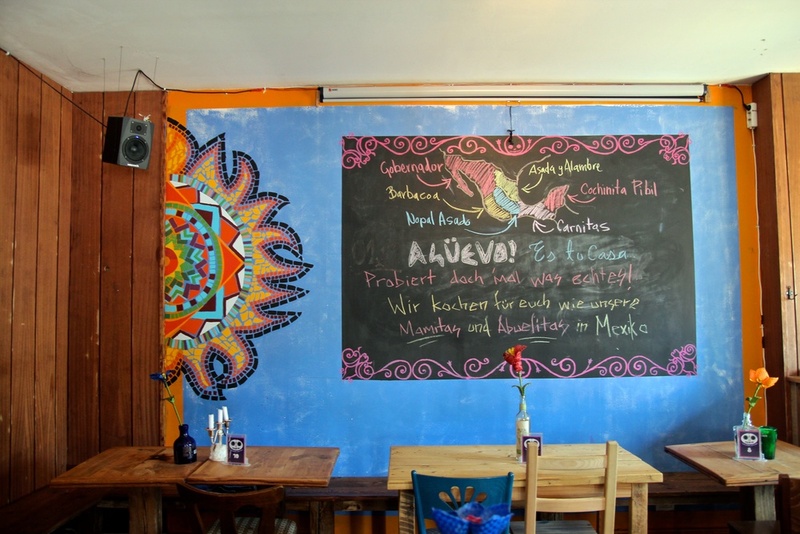 Formally part of Eastern Berlin, Friedrichshain is one of Berlin’s 12 boroughs experiencing rapid gentrification. Traditionally an industrial neighborhood, Friedrichshain was a prime target for Allied bombers during WWII and consequently suffered much destruction. Walking around this borough, one can still find abandoned buildings and gunshot holes in edifices lining bustling streets. As the neighborhood becomes more desirable, more developers are coming to build here and the government, backed by the police, more proactively removes squatters from these abandoned buildings. 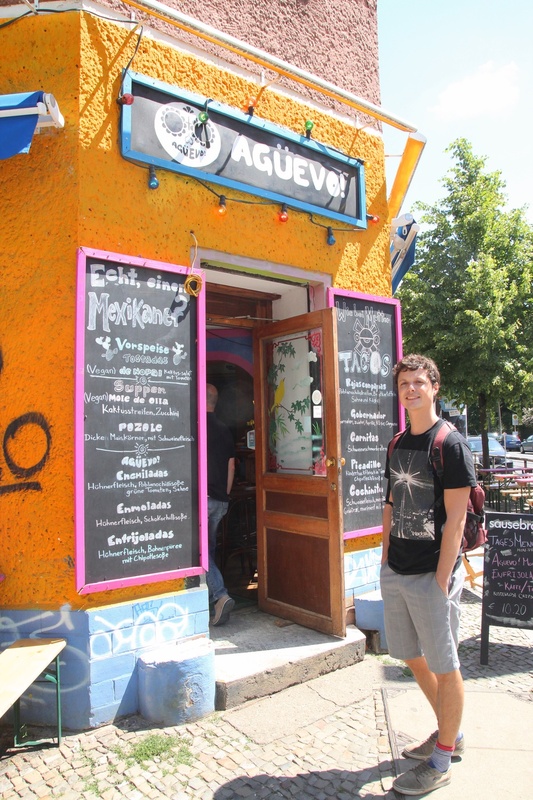 Berlin hosts many incredibly inexpensive restaurants, which allowed us to taste many different bites on our 3 hour walking tour. Starting at Karl-Marx-Allee, formally known as Stalinallee, we met our guide along the infamous boulevard that displays grandiose socialist classicist buildings. Our guide gave us a brief history of the neighborhood and overview of the tour before we embarked on our culinary maze through the borough. Our first tasting was at Fatoush, which coincidentally sports the same name as a restaurant 3 blocks from my house in San Francisco. Fatoush is a Levantine bread salad, composed of fried day-old pita bread, mixed greens, and Arabic spices such as sumac. 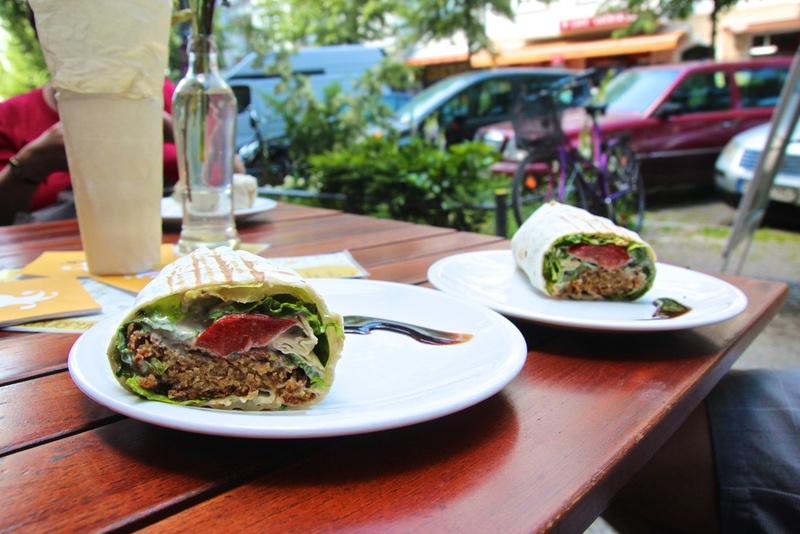 Here we shared a sesame falafel wrap stuffed with lettuce, tomatoes, and a creamy tahini sauce. We had a moment to sit outside as we ate our wraps and enjoyed the fabulous summer weather. The next stop, Green Salad, held true to its slogan "Fresh.Green.Tasty". Serving a combination of wraps, salads, and healthy snacks, this is a great place to grab an inexpensive and healthy meal on-the-go. We tasted a spicy bulgar salad, served in vibrant, hand-painted bowl. The fresh vegetables, parsley and spices gave this otherwise bland grain a tasty makeover. 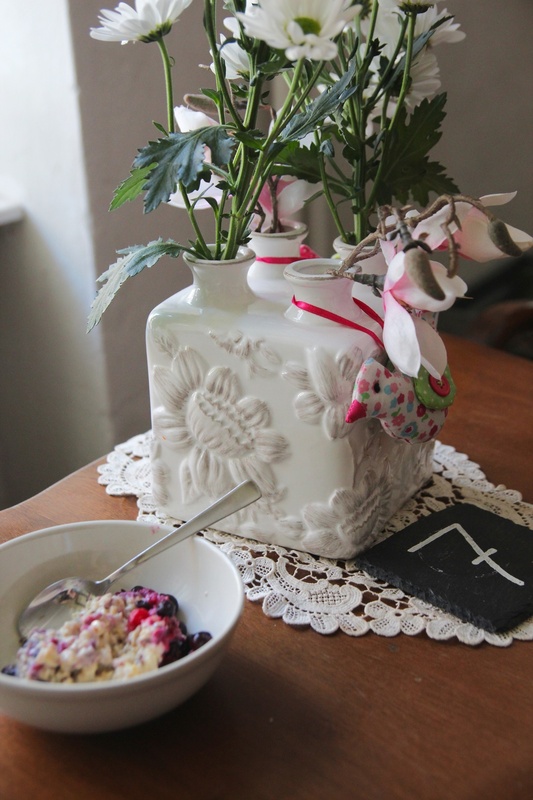 Louise Chérie Café contributes its French pastries, tortes, and charm to Friedrichshain's diverse neighborhood. Decorated with an assortment of antique furniture and other idiosyncratic ornaments, this curious café invites imaginative as well as hungry patrons. Our group shared a large quiche, which like everything else on the menu is baked in-house daily. Living on the border of Mexico, it is safe to say that most Californians are picky about about Mexican food. For this reason, this next stop surprised me the most. The owners and staff at Agüevo! 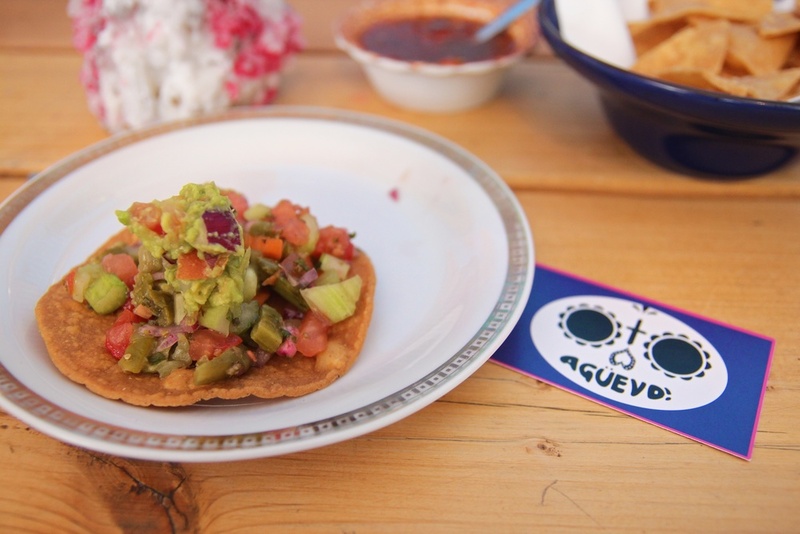 Taquería Cantina use recipes that they have brought from their home country to create an experience reminiscent to that of eating in taquerías in Mexico. Huitlacoche, tortillas azules, enmoladas, and tacos carnitas are just some examples of the house specialties made here. A spicy, red salsa and mild, tomatillo salsa accompanied the chips set on the table. We had nopales (grilled cactus) tostadas topped with fresh salsa. I left curious and wanting to go back and sample some of the other items on the menu! The sweetest stop, Olivia Schokoladen & Tartes, came next. Cubbies filled with chocolates, candies, and cakes lined the walls. Most of the sweets here come from Germany or Austria, so this is a great place to buy local chocolates or other specialties such as cocoa bean tea. For our tasting here, we sampled a piece of 71% dark chocolate which paired with one of the cakes that come sold in hermetically sealed jars. The sweetness of the raspberry, white chocolate cake complimented the berry notes in the chocolate bar when eaten together. Our next stop was a German bistro called e. Similar to Louise Chérie Café, the owners had filled this bistro with antiques, chandeliers, and unique wall fixtures such as unicorn mounted trophies. The food served here matches the comfy and casual atmosphere, and menu items include: bagels, housemade soups, fruit salad, and pastries. 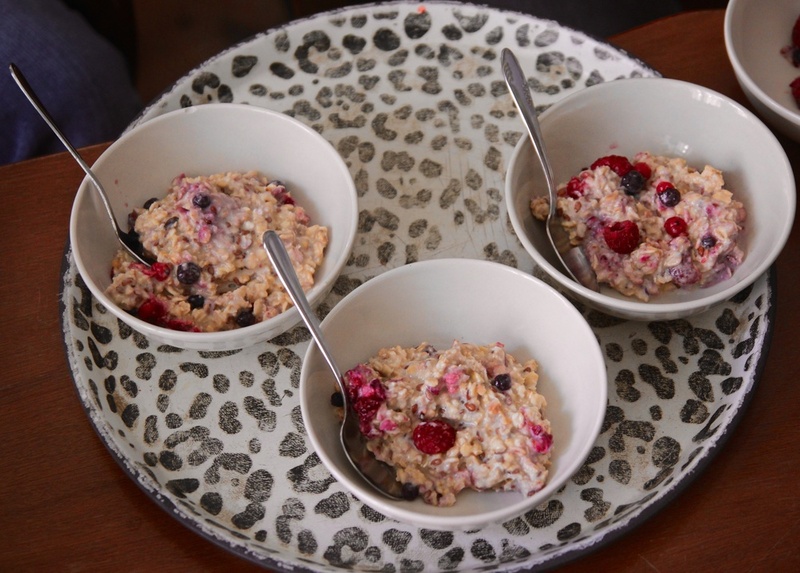 Our group tried the müsli, a creamy oat porridge bowl topped with berries. We stopped at yet another cozy café on our last stop called Schmitzberger. The Austrian owner of this café serves her version of Vienna’s beloved apple strudel and Guglhupf (bundt cake) along with teas and Viennese coffee. 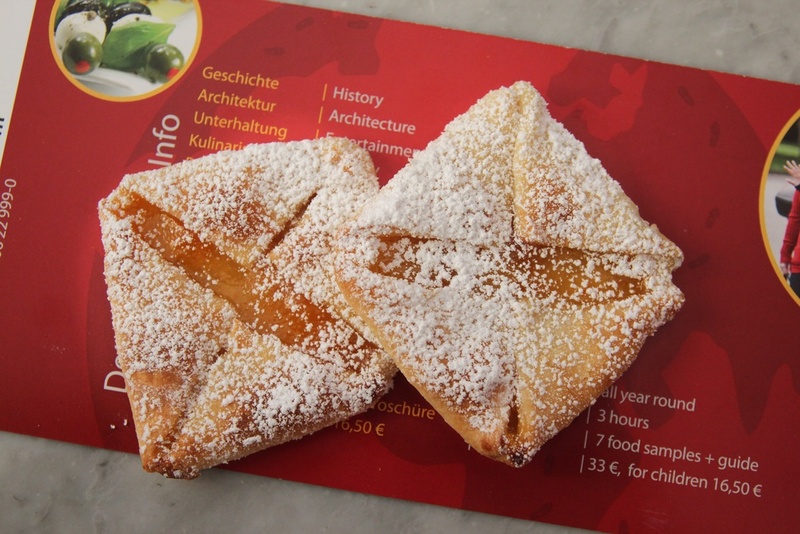 We each got a supple, square-shaped apple pastry, dusted in powdered sugar. This was my first International Food Tour. This tour confirmed my belief that there is no better way to introduce oneself to a new neighborhood, or to become familiar with one's own hometown, than a guided food tour through the city. If you find yourself in San Francisco, be sure to take a food tour with me or one of the other fabulous guides that work for Gourmet Walks. To find out more, click here.